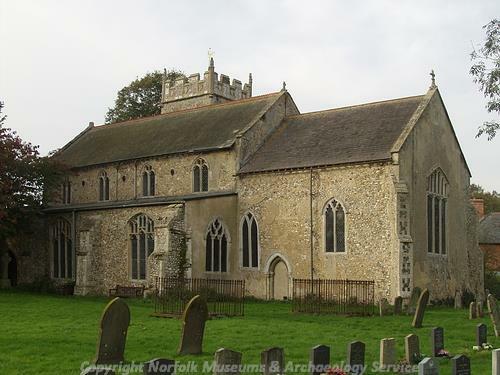 The mid Norfolk parish of Mileham is situated on what was in the 11th century the main east Norfolk route to King’s Lynn. Its name comes from the Old English for ‘homestead with a mill’. The parish has a long history and was certainly well established by the time of the Norman Conquest, its population, land ownership and productive resources being extensively detailed in the Domesday Book of 1086. The earliest evidence of human activity comes in the form of a few prehistoric but otherwise undateable flakes and scrapers (NHER 28801) and a Neolithic partly polished axehead (NHER 13720). A flint axehead found in 1832 may be Neolithic or Bronze Age. The only Bronze Age find to date is a copper alloy spearhead (NHER 7226) that was found in 1938, but more recently, aerial photography has identified several possible ring ditches (NHER 11700, 17655, 18337 and 17656), the remains of flattened round barrows. Iron Age finds are coins (NHER 30999). A harness fitting (NHER 31511) may date from that time, but might equally be Roman. 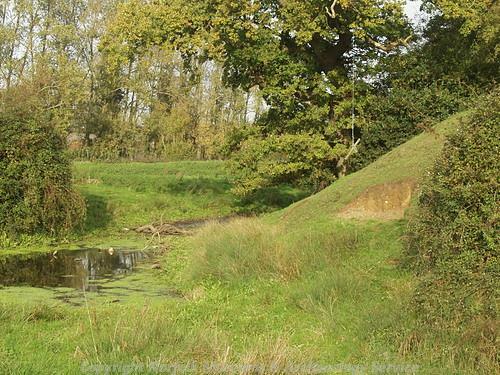 The Launditch linear earthwork (NHER 7235), part of which runs through the parish, is a substantial ditch and bank, the surviving length of which is about 0.9km long. Originally it was much longer and its route has been traced using landscape features, map evidence and aerial photographs for about 6km. It is intersected by a Roman road (NHER 2796). In the mid 20th century it was suggested that the Launditch is Early or Middle Saxon in date, and excavation in 1954 appeared to confirm this. More recent excavations, however, have opened up the possibility that it could date to the Iron Age. Whether it is Iron Age or Saxon in date, it would have formed part of a larger defensive system. From the Roman period onwards, finds become far more numerous. The parish has been extensively explored by fieldwalking and metal detecting, and for the purposes of this summary only selected examples of recovered objects are given. Those wishing to dig a little deeper should consult the detailed records. The Fen Causeway (NHER 2796) is the name given to the Roman road which runs from a junction with Ermine Street and King Street near Peterborough across the Cambridgeshire and Norfolk fens. It was first recorded by Dugdale in 1772. In places, the road is known to run along the crest of a roddon of a natural watercourse and is therefore quite sinuous, while straighter alignments may follow an artificial canal. In Norfolk, the Fen Causeway runs between Upwell and Denver, but in places there is more than one possible route. East of Denver, the road then probably divides into two, with one route heading due east to the Roman town of Venta Icenorum at Caistor St Edmund (NHER 9786) and the other heading northeast towards the Roman town at Brampton (NHER 1006 and 1124). The upland continuation of the Fen Causeway between Denver and Brampton is included under NHER 2796. In a number of places the road is visible as a cropmark on aerial photographs, whilst in several places it survives as a landscape feature. Sections of the road have been excavated on a number of occasions, revealing a cambered metalled surface and side ditches. At Denver, it is dated to the 1st century AD, and there is evidence of extensive settlement and salt production beside it (NHER 4240). Excavations at Downham West in 1993 examined a complex sequence of deposits, including the roddon of a natural watercourse into which a canal had been dug, probably in the early 2nd century AD. The first road surface was found to pre-date the canal, while a second road surface probably ran beside the canal. To the north of Milham village, a concentration of Roman pottery fragments found in 1998 and 1999 may indicate a settlement (NHER 34349). Numerous Roman objects have been found, including coins (NHER 7227, 30999, 31512, 34351 and 42716), pottery fragments (NHER 7256, 7257, 7264 and 7268), brooches (NHER 30999, 31512, 32098 and 34351), a gold ring (NHER 34176) and a silver dish (NHER 7228) that was ploughed up in 1839 and is now in the British Museum. To the north of the current village is the site of Gramston or Grenstein deserted village (NHER 7225), seemingly inhabited from the Late Saxon period until it was abandoned in the 16th century. 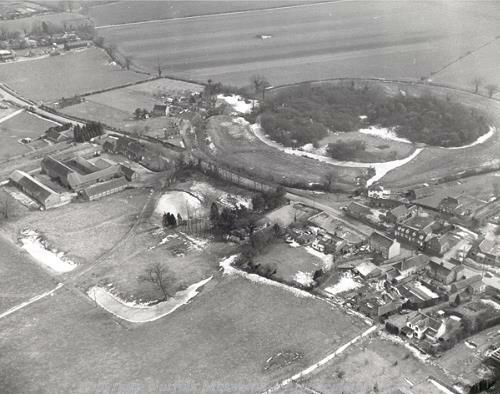 The site was partially destroyed by agriculture in the late 1950s, but excavation work in 1965-6 showed a linear settlement with tofts, a farm, trackways and a pond. Large quantities of pottery fragments and other objects have been recovered from the area. The outlines of features can still be seen from the air. Saxon objects recovered include pottery fragments (NHER 7257, 7258, 7259, 7264 and 7268), coins (NHER 30999), brooches (NHER 35302) and a buckle (NHER 42716). The medieval period has left the parish with its oldest surviving structures, or at least traces of them. Mileham Castle (NHER 7230) is one of the largest motte and bailey castles in Norfolk. It straddles the B1145, a pre-Conquest road that remained the main east-west route through the county until the 17th century. The castle was constructed in about 1100 and its remains form a surprisingly imposing monument consisting of a motte built up around the fragments of a stone keep, two baileys and a further banked rectangular enclosure to the north of the road, which now contains Burwood Hall (built in 1793) and farm buildings. A large wooded deer park was once attached to the south of the castle. The positioning of the castle astride the road is thought to have been connected with raising revenue from a possible market place in the northern enclosure and from tolls on travellers. It is probable that the castle had fallen out of use by about 1300, but before then the tall keep, probably whitewashed, when seen against the green wooded backdrop of the deer park, would have been an impressive sight. To the east of the castle is St John’s Church (NHER 7271). This unusual church consists of an aisled nave, an offset northwest tower and a lofty chancel. It is Norman in origin, though possibly on the site of an earlier church, with 13th to 15th century additions, the 14th century tower probably being offset so as not to obscure the particularly fine early 14th century west window, which astonishingly retains much of its original stained glass, the largest surviving example in Norfolk. Inside, the arcade to the south aisle leans outward alarmingly due to subsidence, but was stabilised in 1981. The interior also has many rare fittings and inscriptions. Two medieval stone coffin lids are set upright, one by the north door and one by the south. The 15th century pulpit sits on a single stem and has traceried panels. The 15th century octagonal font also has traceried panels and its plinth has glazed medieval tiles. 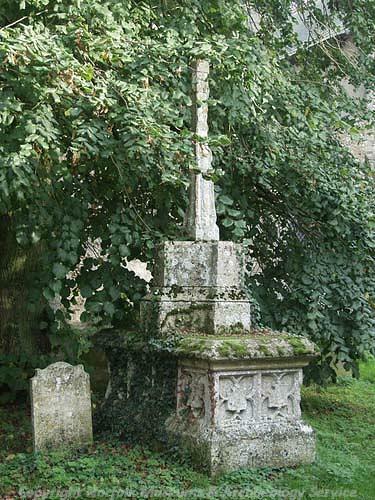 In the churchyard is a probably unique early medieval cross base, set on a 15th century tomb chest. North of the road is Giant’s Moat (NHER 7229), a medieval moated site with cropmarks of outer enclosures. When the moat was being cleared out in 1945, the remains of the drawbridge, medieval pottery fragments and a Late Saxon sword were found. Fieldwalking has since recovered Roman and medieval pottery fragments. Large quantities of medieval pottery fragments have been recovered, mainly by fieldwalking. Examples include NHER 7257, 7260, 7261, 7262, 7268 and 21555. Other medieval finds include pieces of millstone (NHER 7264 and 7268), coins (NHER 7270, 30999, 32613 and 41688), a seal matrix (NHER 35302), brooches (NHER 30999) and a jetton (NHER 32312). Of the post medieval buildings to survive, probably the earliest is the Unicorn Inn (NHER 17841). Now a house, this building has a 17th century or earlier core, extended and encased in brick in the 18th or 19th century. Church Farmhouse (NHER 20153) on The Street is a 17th century two storey thatched rendered timber framed farmhouse with a five window bay brick skin added to form a polite late 18th century façade. It has a central chimney stack with four angled shafts. The original winding staircase remains to the rear of the stack, which has an 18th century passageway running right through it. There is a good staircase of about 1730 with turned balusters and a moulded handrail. Hall Farmhouse (NHER 44610) is a mainly 18th century two storey brick farmhouse with an earlier gable end and a rear pile dating to about 1800. The house has a fine 18th century interior, several rooms containing raised panelling. The half turn stair has a corner landing and a main landing on two sides. There is also a fine Regency fire grate. Park Farmhouse (NHER 44612) is a late 18th or early 19th century two storey brick and flint farmhouse, T shaped in plan, the cross wing forming the main block. 1, 2 and 3 The Street (NHER 12094), is a row of three 19th century brick and flint cottages with tie beams of untrimmed tree trunks. Inside are various interesting ovens and coppers. A more recent building is The Old Chapel on Back Lane (NHER 42764), a former late 19th century brick Methodist chapel. Its façade is in the gable end facing the street, and has two tall narrow windows flanking the arched door. Beneath each of the windows is a foundation stone laid in 1886, inscribed with the names of ministers and local worthies. The interior has reportedly been stripped, and this may be in advance of conversion work. Also on Back Lane is a type K6 square glazed cast iron telephone box (NHER 44611) with a domed roof. It was built to a 1935 design by Sir Giles Gilbert Scott. Near The Mill House is the site of a post mill (NHER 11701), marked on late 18th and 19th century maps. It was replaced by a tower mill in 1891, and for a time the two buildings stood side by side. Piet Aldridge (NLA), 2 November 2006.